Posted on 3, June 2016 by EuropaWire PR Editors | This entry was posted in Automotive, Germany, Internet & Online, Management, Sports and tagged amplus AG, BMW Motorsport, Christof Englmeier, DTM, Jens Marquardt. Bookmark the permalink. MUNICH, 03-Jun-2016 — /EuropaWire/ — amplus AG is the new Official Partner of BMW Motorsport in the DTM. The company based in Teisnach (DE) is the leading broadband company in eastern Bavaria, and provides more than 100 municipalities in 13 districts of Lower Bavaria and the Upper Palatinate with broadband connections of 200 megabits per second and above. The company’s main focus is on expanding its own fibre-optic network. 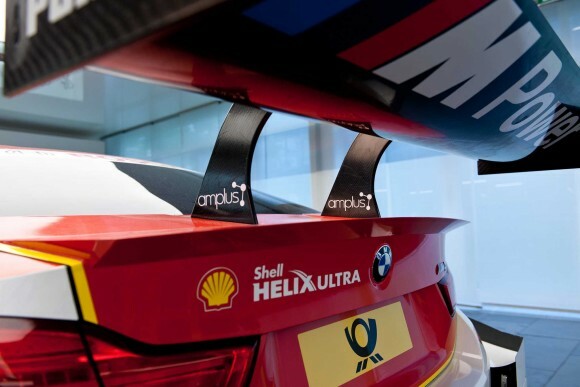 As the Official Partner, as of the races at the Lausitzring (DE), amplus AG will be represented prominently with its logo on four BMW M4 DTMs as part of a long-term, sustainable partnership. Since the company was founded in 2009, amplus AG has established itself as one of the leading broadband companies in southern Germany. As a subsidiary of the CCNST Group and second-largest broadband carrier in Bavaria, the Lower Bavarian Internet provider supplies more than 100 municipalities in 13 districts of eastern Bavarian with broadband connections of 200 megabits per second. Several thousand customers already benefit from amplus AG’s broadband network. Many more will follow in the coming years. “Fast Internet for everyone” has been the philosophy of amplus AG from the outset and the guiding principle of their business operations. The relatively young company is already transitioning from a network operator to a provider of premium online services. From smart homes through e-mobility to telemedicine: Thanks to the latest fibre-optic technology and fibre optic cables into homes, municipalities, business customers and private users all benefit from amplus AG’s growth strategy. In cooperation with the municipalities in their catchment area, this is why all 80 employees of the CCNST Group are devising individual concepts for the planned fibre optic expansion. Rural regions in particular are among the attractive locations in Bavaria through their connection to the six-lane digital highway. In a collaborative partnership, amplus AG therefore develops innovative broadband solutions with a long-term focus for regions away from urban centres.